Coat the sauce pan with a thin layer of water, then pours baked beans and heat up over low to medium heat. Heat up the butter in a non-stick frying pan. For the egg mixture, whisk together eggs and milk, then pour it into the hot pan with melted butter. Stir constantly at medium heat until the eggs set. 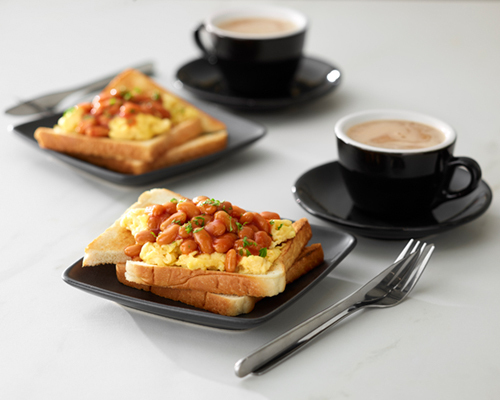 Serve the scrambled egg with baked bean on toast. Add on parsley and peppers as garnish. Comments: This perfect breakfast meal made with the humble baked beans & egg is a nutritional powerhouse of good carbs(low GI), protein, fiber, selenium and calcium. The fiber from baked beans is not digested but moves into the colon to produce fatty acids that prevents colon cancer. The cholesterol content of about 88% of our daily value comes from the whole eggs (yolk) added in the recipe and this can be reduced by substituing whole eggs with egg whites - use two egg whites or 1/4 cup (59 milliliters) cholesterol-free egg substitute in place of one whole egg.